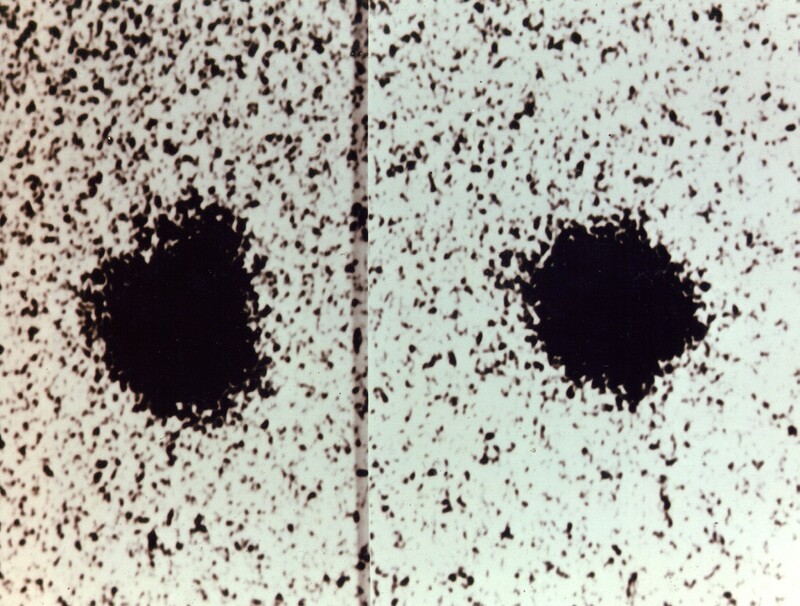 For decades Pluto was simply a faint dot on a photographic plate. When it was discovered in 1930 by Clyde Tombaugh, it was indistinguishable from a faint 13th magnitude star except for its slowly changing position over the course of days. We called it a planet, but we really had no idea what type of solar system body it was. From photographic plates we could make a reasonable determination of its orbit, and we found that it was rather different from the other planets. It was much more elliptical, and its orbital plane was tilted relative to most of the other planets. From a faint photographic point we could only estimate its size. Some thought it might be a large and dark planet, while others small and bright. There just wasn’t enough information to tell. The small bulge indicates the presence of a moon. It wasn’t until 1978 that we discovered Pluto had a moon. It was then that James Christy noticed a small bulge on a magnified image of Pluto that would appear and disappear. We called the moon Charon, but again we knew little about it. With better imagery, the orbits of Pluto and Charon gave us an indication of their mass. We could finally start determining the characteristics of Pluto. We found that it has a density less than half that of Earth, and that its surface is mostly nitrogen ice. It’s composition was more like a comet than a rocky planet. By the 1990s we began to discover other Pluto-like objects in the outer solar system, but Pluto remained our favorite. Beloved perhaps for what we didn’t know about the world rather than what we did. So in 2006 we launched a probe toward the small world. To reach Pluto in a reasonable time, it would need to move quickly. It was the fastest spacecraft we’ve ever launched, and over the next 9 years it would need to travel nearly 5 billion kilometers away from Earth. It also had to arrive at just the right position at just the right time. It posed quite a challenge given that when New Horizons was launched we still didn’t know Pluto’s size with great precision. Yet as New Horizons makes its closest approach today, it is within 70 kilometers and 72 seconds of its predicted path. That level of precision over billions of kilometers is nothing short of amazing. The media will be flooded with news of Pluto today, and rightfully so. In less than a century we have turned a faint point of light into a beautiful reddish world. And this is only the beginning of what we will learn from New Horizons in the coming months. After decades of planning, we have traveled to what was once our most distant planet. Well done, humanity. Well done. Back when it was being demoted, I once joked that Pluto, or rather PLUTO was an acronym for Planet-Like Ultra Terrestrial Object. Now we get to see what it looks like.